LONDON/CAIRO/ISTANBUL: Prime Minister Theresa May defended Britain’s links to defense and security ally Saudi Arabia yesterday, as Saudi Crown Prince Mohammed bin Salman met Britain’s Queen Elizabeth for lunch at the start of a high profile state visit to London. Photographs posted online showed London taxis displaying advertising graphics welcoming Prince Mohammed, and electronic billboards promoted pro-Saudi messages with the hashtag #anewsaudiarabia. 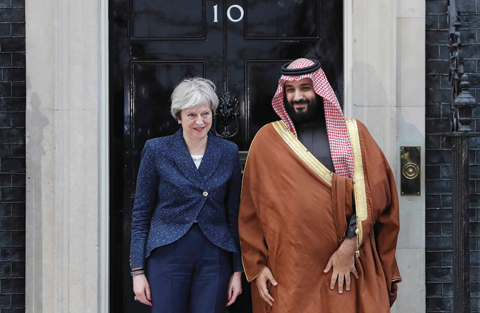 May defended the invitation and Saudi involvement in Yemen when she was grilled in parliament over why Prince Mohammed was being afforded the red carpet treatment during his three-day visit. “The link with Saudi Arabia we have is .. Downing Street earlier said it hopes the visit, part of the crown prince’s maiden foreign tour as heir to the throne, “will usher in a new era in bilateral relations”. After lunch with the Queen, Prince Mohammed jointly hosted with May the inaugural meeting of the UK-Saudi strategic partnership council, including ministers from both countries. The meeting focused on support for reforms in Saudi Arabia, trade and investment relations and defense and security cooperation. In the evening, the heir-to-the-throne Prince Charles held a dinner for the crown prince with Prince William among the guests. Opposition Labour leader Jeremy Corbyn had accused May’s government of “colluding” in war crimes by selling arms to Saudi Arabia, and even suggested that British military advisers were “directing the war”. May responded that her relationship with Prince Mohammed had already helped alleviate the humanitarian crisis by convincing him to ease Saudi blockades of ports in Yemen during a meeting in December. “This vindicates the engagement that we have with Saudi Arabia, to be able to sit down with them,” she said. Meanwhile, Egypt’s Al-Shorouk newspaper reported yesterday Prince Mohammed has described Turkey as part of a “triangle of evil” along with Iran and hardline Islamist groups. The Saudi prince also accused Turkey of trying to reinstate the Islamic caliphate, abolished nearly a century ago when the Ottoman Empire collapsed. His reported comments reflect Saudi Arabia’s deep suspicion of President Recep Tayyip Erdogan, whose ruling AK Party has its roots in Islamist politics and who has allied his country with Qatar in its dispute with Saudi Arabia and some other Gulf states. Turkey has also worked with Iran, Saudi Arabia’s archrival in the Middle East, to try to reduce fighting in northern Syria in recent months, and Iranian and Turkish military chiefs exchanged visits last year. Al-Shorouk quoted Prince Mohammed as saying “the contemporary triangle of evil comprises Iran, Turkey and extremist religious groups”. The prince spoke to Egyptian newspaper editors during a visit to Cairo, on his first foreign trip since becoming heir to the oil exporting giant last year. He said the dispute with Qatar could be long-lasting, comparing it to the US embargo of Cuba imposed 60 years ago, but played down its impact, dismissing the Gulf emirate as “smaller than a Cairo street”. Saudi Arabia, the UAE, Egypt and Bahrain cut diplomatic and trade links with Qatar last June, suspending air and shipping routes with the world’s biggest exporter of liquefied natural gas, which is home to the region’s biggest US military base. However, Prince Mohammed said Qatar would not be barred from attending an Arab summit hosted by Saudi Arabia later this month. Separately, criticism mounted in Turkey yesterday over a decision by Saudi-owned broadcaster MBC to stop airing Turkish soap operas, stoking tensions between Ankara and Riyadh. Viewers in the Arab world have in recent years become voracious consumers of Turkish soaps ranging from modern romances to historic dramas, enthralled by cliffhanger plots and strong production values. But the move by the Dubai-based MBC comes with tensions between Turkey and Saudi Arabia and Riyadh’s chief regional ally the UAE soaring over issues ranging from Qatar to Israel. MBC said it would replace Turkish soaps with “premium quality Arabic dramas that embody the values and traditions of the region”. Turkish Culture Minister Numan Kurtulmus replied it was not up to politicians to “decide… who watches what film. Those times have passed.” He was quoted by the state-run Anadolu news agency as saying that Turkish soap operas had made “rapid progress” in recent years and were now popular “all over the world”. Istanbul Chamber of Commerce (ITO) head Ozturk Oran said Turkey would look for private alternatives to defy the satellite network’s ban because Turkish soaps were “making serious business”. “As long as Turkish series keep their good quality, nobody can bar Turkish productions,” he said, quoted by Anadolu, adding that producers could use carriers other than MBC to promote Turkish series. Mevlut Tezel, columnist in the pro-government daily Sabah, called the ban a “blow to Turkey’s soft power” as well as its influence and popularity in the Middle East. Some Turkish soap operas have achieved phenomenal success in the Arab world, turning stars like actress Serenay Sarikaya and actor Kivanc Tatlitug into household names. Actor Engin Altan, who stars in Ertugrul, a hit series on the earliest period of Ottoman history, told Al-Jazeera the decision would “surely have an impact on the Turkish series industry” although viewers could find other means to watch shows. Turkey has repeatedly bickered with the UAE over the last months, even to the point of naming the street where Abu Dhabi’s embassy is located in Ankara after an Ottoman governor. While Turkish officials have taken the gloves off in verbal onslaughts against Abu Dhabi – in particular Crown Prince Mohammed bin Zayed – Ankara has been more circumspect in comments on Saudi Arabia. But pro-government media have adopted an increasingly strident tone against Riyadh in recent weeks, reaching a new peak with an angry editorial yesterday by a columnist close to Erdogan.